NISSAN recommends rotating the tires every 8,000 km (5,000 miles). For additional information on tire replacing procedures, refer to “Flat tire” in the “In case of emergency” section in this manual. As soon as possible, tighten the wheel nuts to the specified torque with a torque wrench. The wheel nuts must be kept tightened to specifications at all times. It is recommended that wheel nuts be tightened to specification at each tire rotation interval. After rotating the tires, check and adjust the tire pressure. Do not include the spare tire in the tire rotation. For additional information regarding tires, refer to “Tire Safety Information” in the Warranty Information Booklet. Tires should be periodically inspected for wear, cracking, bulging or objects caught in the tread. If excessive wear, cracks, bulging or deep cuts are found, the tire(s) should be replaced. The original tires have built-in tread wear indicators. When the wear indicators are visible, the tire(s) should be replaced. Tires degrade with age and use. Have tires, including the spare, over 6 years old checked by a qualified technician because some tire damage may not be obvious. Replace the tires as necessary to prevent tire failure and possible personal injury. Improper service of the spare tire may result in serious personal injury. If it is necessary to repair the spare tire, contact a NISSAN dealer. For additional information regarding tires, refer to “Important Tire Safety Information” or in the Warranty Information Booklet. When replacing a tire, use the same size, tread design, speed rating and load carrying capacity as originally equipped. Recommended types and sizes are shown in “Wheels and tires” in the “Technical and consumer information” section of this manual. The use of tires other than those recommended or the mixed use of tires of different brands, construction (bias, bias-belted or radial), or tread patterns can adversely affect the ride, braking, handling, ground clearance, body-totire clearance, tire chain clearance, speedometer calibration, headlight aim and bumper height. Some of these effects may lead to accidents and could result in serious personal injury. 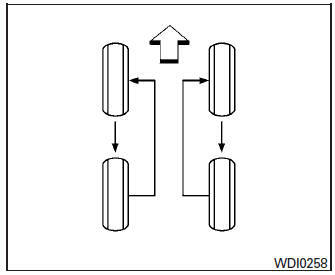 If the wheels are changed for any reason, always replace with wheels which have the same off-set dimension. Wheels of a different off-set could cause premature tire wear, degrade vehicle handling characteristics and/or interference with the brake discs/drums. Such interference can lead to decreased braking efficiency and/or early brake pad/shoe wear. 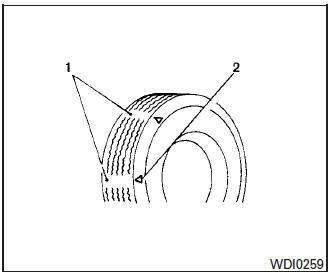 For additional information on wheel off-set dimensions, refer to “Wheels and tires” in the “Technical and consumer information” section of this manual. Do not install a damaged or deformed wheel or tire even if it has been repaired. Such wheels or tires could have structural damage and could fail without warning. The use of retread tires is not recommended. Unbalanced wheels may affect vehicle handling and tire life. Even with regular use, wheels can get out of balance. Therefore, they should be balanced as required. Wheel balance service should be performed with the wheels off the vehicle. Spin balancing the wheels on the vehicle could lead to mechanical damage. Wash the wheels when washing the vehicle to maintain their appearance. Clean the inner side of the wheels when the wheel is changed or the underside of the vehicle is washed. Do not use abrasive cleaners when washing the wheels. Inspect wheel rims regularly for dents or corrosion. Such damage may cause loss of pressure or poor seal at the tire bead. NISSAN recommends waxing the road wheels to protect against road salt in areas where it is used during winter. Since the spare tire is not equipped with the TPMS, when a spare tire is mounted (TEMPORARY USE ONLY or conventional), the TPMS will not function. Observe the following precautions if the TEMPORARY USE ONLY spare tire must be used. The spare tire should be used for emergency use only. It should be replaced with the standard tire at the first opportunity to avoid possible tire or differential damage. Drive carefully while the TEMPORARY USE ONLY spare tire is installed. Avoid sharp turns and abrupt braking while driving. Periodically check spare tire inflation pressure. Always keep the pressure of the TEMPORARY USE ONLY spare tire at 60 psi (420 kPa, 4.2 bar). With the TEMPORARY USE ONLY spare tire installed do not drive the vehicle at speeds faster than 50 mph (80 km/h). When driving on roads covered with snow or ice, the TEMPORARY USE ONLY spare tire should be used on the rear wheels and the original tire used on the front wheels (drive wheels). Use tire chains only on the front (original) tires. Tire tread of the TEMPORARY USE ONLY spare tire will wear at a faster rate than the standard tire. Replace the spare tire as soon as the tread wear indicators appear. Do not use the spare tire on other vehicles. Do not use more than one spare tire at the same time. Do not tow a trailer when the TEMPORARY USE ONLY spare tire is installed. Do not use tire chains on a TEMPORARY USE ONLY spare tire. Tire chains will not fit properly and may cause damage to the vehicle. Because the TEMPORARY USE ONLY spare tire is smaller than the original tire, ground clearance is reduced. To avoid damage to the vehicle, do not drive over obstacles. Also, do not drive the vehicle through an automatic car wash since it may get caught.